Google goes greenPopular Internet company, Google, has joined more than 30 computer companies to develop the Climate Savers Computing Initiative, a pledge to use and develop energy-efficient computers and associated equipment. By 2010, the impact of the Initiative is expected to reduce PC power consumption and associated greenhouse gas emissions by 50%. Google also plans to become carbon neutral by the end of 2007 by implementing energy-reducing strategies, including using computers with more energy-efficient power supplies and more efficient DC-to-DC converters. Other Google green initiatives include a fuel-efficient vehicle incentive, a corporate shuttle program for commuting to work, and sourcing organic, locally-grown food for their onsite cafeterias. A massive1.6 megawatt solar photovoltaic array was installed at the Silicon Valley campus, the largest solar installation on any corporate campus in the U.S. and enough to power 1000 local homes. In 2005, information and communication equipment, within Australian businesses, generated 7.94 million tonnes of carbon dioxide almost as much as emissions from the civil aviation and metal production industries. The Australian Computing Society has called on government to extend the Appliance Energy Label system to information and communication equipment for businesses and homes. Our current energy rating system uses stars to rate the energy efficiency of electrical products, including air conditioners, refrigerators, washing machines, clothes dryers and dishwashers. According to Climate Savers Smart Computing, desktop PCs waste nearly half the delivered power through heat loss. Making energy-efficient computers not only cuts greenhouse gas emissions, but reduces costs of operation. Less energy lost to heat, less air-conditioning required to cool offices, data centres, and homes. What can you do? Enable the power-saving features on your PC – the single, most important factor reducing PC energy use. Power management places your PC, including monitor and hard drives, into a ‘sleep’ mode when idle. Simply touch the mouse or keyboard to ‘wake-up’ your PC. Or take a few seconds to install CO2 Saver, a lightweight program that manages your computer’s power usage for you. Of course, you already know to turn your PC and monitor off at the wall when not in use. BlogOz – where were you? meeting new friends is great! meeing 120 new blogger friends in one day even better. Organised to perfection. Attended by the who’s who of Australian bloggers, who engaged, exchanged, and enlightened. For me it was like attending a Russian neurosurgery meeting knowing nothing more than “nyet”. But today I’ve created, conceived, connected, twittered and blogged. Thanks to all my new friends for your valuable input and hand holding, including Des Walsh, Joanne Jacobs, Peter Black, Nick Hodge, Melissa, Duncan and Anthony. We’ve had APEC, Al Gore, Canberra Floriade, Toowoomba Carnival of Flowers, and football finals. Great, let’s take a breather, but how will we cope with such an anticlimax? Ah yes, Christmas is just around the corner, I hear you say. Seasons come and seasons go, but there’s always another opportunity for people to spend copious amounts of money on things they don’t like, for relatives they don’t cherish, to impress people they don’t like. Has global warming dominated the environmental debate to the degree that we’ve forgotted about the environmental impact of consumerism? Ten year ago, before climate change (BCC), well prior to global debate, we talked about pollution, consumerism, and rain forest destruction. You joined Greenpeace, saved whales, and became a vegetarian. These were the badges of concern. Action was communal, practical, warm and fuzzy. How will the change in focus on environmental concerns affect the outcomes. Yes, per capita the public awareness of environmental issues might be higher than in 1990s, but is conservation of natural resources and wildlife taking a reluctant back seat? 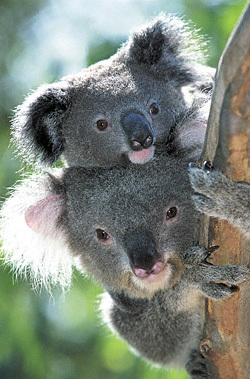 Should we switch the climage change focus, particularly in Australia, back to saving koalas, for example?